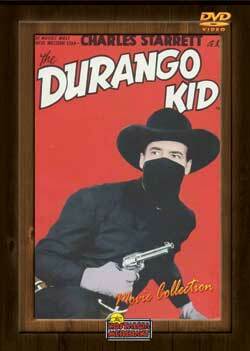 The Durango Kid was one of the most popular western film series of the 40’s and 50’s starring Charles Starrett as the hero who wore a mask to hide his identity. The stories always provided plenty of comedy relief and was one of the longest running series of all times. This collection includes 24 full-length features. MOVIE TITLES: The Return of Durango Kid (1945), Both Barrels Blazing (1945), Blazing the Western Trail (1945), Lawless Empire ( 1945), The Desert Horseman (1946), Terror Trail (1946), The Fighting Frontiersman (1946), Law of the Canyon (1947), Buckaroo From Powder River (1947), Last Days of Boot Hill (1947), Six-Gun Law (1948), Phantom valley (1948), Whirlwind Raiders (1948), Blazing Across the Pecos (1948), Laramie (1948), South of Death Valley (1949), Trail of the Rustlers (1950), Streets of Ghost Town (1950), Snake River Desperadoes (1951), Cyclone Fury (1951), Pecos River (1951, Laramie Mountains (1952), The Rough, Tough West (1952), The Kid From Broken Gun (1952).